The base of a lithosphere is also called as lithosphere-asthenosphere boundary (LAB). The depth where temperatures intersect a mantle adiabat with a potential temperature of ~1300 °C is often taken as the base of geodynamical/thermal lithosphere, and the top of the seismic LVZ (low-velocity zone) is taken as the base of the seismic lithosphere. Seismic tomography can offer 3D deep-structure model, however, the seimsic LAB defination is ambiguous. Since the thermal LAB defination is according to a definite potential temperature, it is easy to determined when a temperature model is offered. From thermoelastic parameters, temperature can be inverted from seismic velocity (Goes et al., 2000). An & Shi (2006, 2007) showed, the depth where their calculated temperatures intersect a mantle adiabat with a potential temperature of ~1300 °C (thermal LAB) is in close correspondence with the top of the seismic low velocity zone (seismic LAB) for most regions. This correspondence implies that seismic lithosphere estimated from short-time scale seismic information may be equivalent to the long-time scale geodynamical lithosphere, but also implied the temperature estimation method is reliable. Therefore, if a seismic model is obtained, a corresponding temperature also can be obtained, and LAB can be determined by thermal LAB defination. 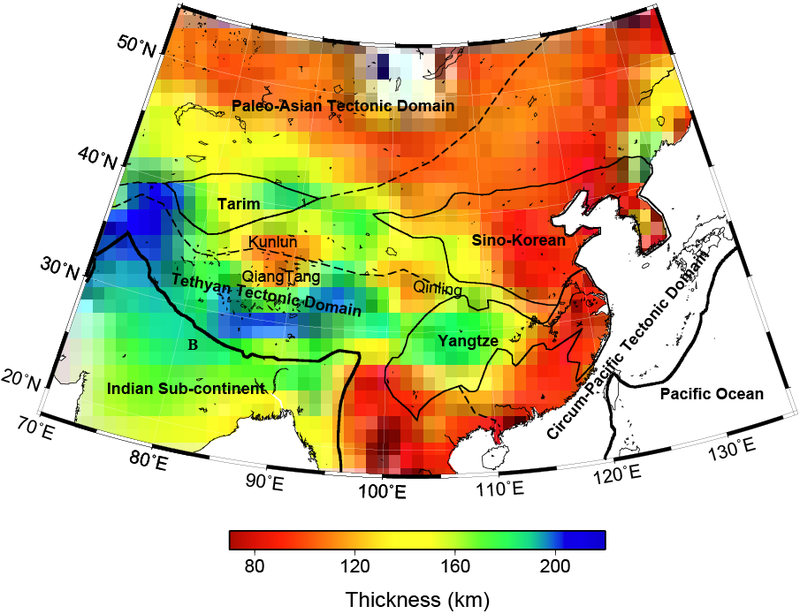 The lithosphere thickness models below are determined according to the above ideas which is explained in An & Shi (2006, 2007). Goes, S., Govers, R., Vacher, P., 2000. Shallow mantle temperatures under Europe from P and S wave tomography. J. Geophys. Res., 105(B5), 11153-11169. Huang, Z., Su, W., Peng, Y., Zheng, Y., Li, H., 2003. Rayleigh wave tomography of China and adjacent regions. J. Geophys. Res., 108(B2), 2073. doi:10.1029/2001JB001696.